A master craftsman in the old-world tradition. Sal Polisi, born in 1935, died in January 2015. See the New York Times obituary. We hope this website will inspire experienced and aspiring woodcarvers, and everyone else, to engage in pursuits you love -- as Sal did. 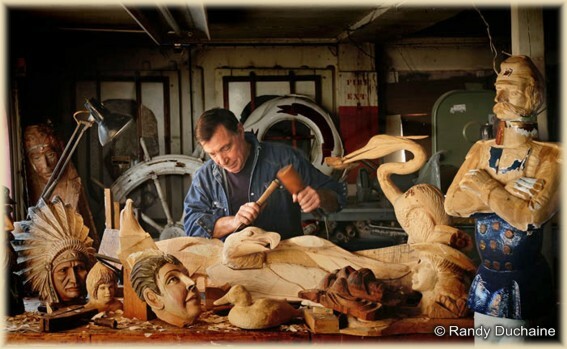 Wood comes to life under the skilled craftsmanship of sculptor and master woodcarver Sal Polisi. Since 1980, Sal has been creating hand-carved pieces in many types of wood for businesses, homes and vessels. Early in his career, Sal studied with master carver Marcus Baiter and also trained with master carver Franco Pascale at the Bartolozzi & Maioli studios in Florence, Italy. Drawn to artistic pursuits since childhood, Sal custom-designs his pieces, frequently incorporating special requests from his clients. His work is 3-dimensional or bas-relief. He is expert at gold-leafing and wood-burning, and he is also skilled at restoring wood pieces. Sal's love of all things maritime is evident in his work. He is frequently commissioned to carve figureheads for ships, model figureheads for collectors, fish and shellfish, and stern boards and side boards for historic ships and boats. An early carving of a tugboat's pilot house eagle has led him into carving dozens of eagles, often in the Bellamy tradition. He also creates distinctive signs for businesses, many with gold-leaf letters. Sal can be seen at work at the South Street Seaport Museum in New York City, where for nearly 30 years he has maintained a studio that is visited by travelers from all over the world. Sal has created and restored items for many of the Museum's historic vessels, including the squarerigger Wavertree, 1885; barque Peking, 1911; schooner Pioneer, 1883; schooner Lettie G. Howard, 1893; tugboat W.O. Decker, 1930; and paddlewheeler Andrew Fletcher (reproduction), 1985.